This is a list of our Parish and Community groups and notices which relate to each. Click on the group name below for more information. If you would like your community group or service to appear on our website please contact the Parish Office. Meet every 2nd wednesday at 5pm. If your child is interested in joining the group please call into the church on the above day and time and speak to one of our leaders. ￼If you feel attracted to our way of life, and would like to know more, we invite you participate in a three month Orientation program — meeting with us on the second Saturday of each month — during which you will have an opportunity to learn more about the SFO, ask any questions you may have, and get to know the members of our community. ￼ What is the SECULAR FRANCISCAN ORDER? Do you dismiss the idea because you are married or have to live in the secular world? If the answer to any of these questions is “Yes”, then read on. Everyone has heard of the Franciscans. Indeed the Franciscan orders are the most successful and popular of all the religious orders. At the heart of the Franciscan orders is St. Francis himself, whose life was, and is still, an inspiration to millions of people around the world. His message was, and remains, one of total love for, and commitment to, Jesus Christ and Christ’s values, so clearly revealed to us in the Gospels. Francis lived between 1182 and 1226. He had a great religious experience when he heard the voice of God from the crucifix in the derelict church of St Damiano in Assisi saying “Francis, rebuild my church which you can see is falling down”. Although at first Francis took the message literally he very soon came to realise that he was meant to bring a freshness of the spirit of love for God, his fellow man and indeed to all creation into a church that needed new life. He was very popular and drew people to follow him. However, many people who had homes and families, also wanted to follow the Franciscan way of life. So Francis established an order for them. Originally known as the The Third Order we are now known as the Secular Franciscan Order and this order, along with the first order, The Friars Minor, and the second order, The Poor Clares, is 800 years old. Today the world has become increasingly materialistic and unbelieving. Franciscans are needed to take the joy of the love of Christ to people. The message is still of total love of God, our fellow man who, and where, ever he is, and indeed all of creation. A simple message that calls for a simple life, and a reassessment of our values. In this way although the Order is 800 years old the message is modern and for today. May he show his face to you and have mercy on you. Conference of St. Clare. 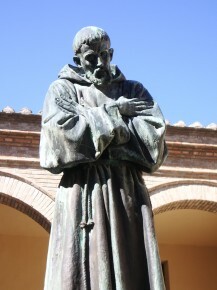 Conference of St. Francis.